For quite sometime I have known about the story of Mr. Bunpei Sonehara, who is largely considered to have been the last commercial tenkara angler in Japan. He recorded his story, which subsequently got published on this site in Japanese. It is a very interesting peak into the life of the last tenkara angler, who was forced to retire when the river he fished was dammed. The damming of the river caused commercial fishing – an activity that had been practiced on that river for centuries – to cease to be sustainable. My friend Masaki Nakano translated the story of Mr. Sonehara to share with you. 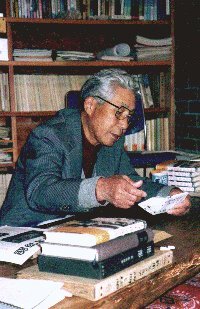 About Bunpei Sonehara: Born in 1915. Started working for the South Manchurian Railway in 1937. Lost his wife during the WWII and returned Japan with two children in 1946. Started Tenkara fishing and it was commercially successful until the fourth dam was built at the Kurobe river. It was August 16th, 1946 when I left Harbin, China for Japan. It took me long fifty five days to get back to my hometown, O-machi in Nagano. My wife passed away from illness in utter chaos right after the war. Two of my little children were the only cheer and hope I had. Back in O-machi, the oldest brother of mine let us stay at his house, but the house was too small for two families to live in. We moved to a sericultural hut nearby after having survived the first winter. All the money I was allowed to have upon returning Japan was two thousand yen. It was the limit per person. Everything else was confiscated in Harbin as we left. Luckily, my children were also allowed to have two thousand yen each. Sadly, this is how we came back home. What I had in mind was how I was going to get a job to feed my children. I had a dire need for a job. The first job I found was to smuggle food in a black market. It was a risky job. If I had been found, officers would have confiscated everything. I was soon done with the job. The second job, an antique dealing job, was given by the second brother. It didn’t take too long until I quit the job. I wasn’t a businessman after all. I was just depressed and lethargic. Maybe because we lost the war, I was desperate. It was the second brother who invited me to go fishing. He must have empathized with me being depressed. He simply loved fishing in the mountains. I remember having gone fishing with him before the war. I was asked to babysit his child while he was fishing. One day, we left O-machi heading to Kashima where the O-tsubeta flows into the O-kawa. As we got there, we found ourselves in the open. There were some nice deep pools. He rigged a rod and gave it to me at one of the pools. There was a fly tied at the end of the tippet. “Start here. Drop the fly and let it drift. When you see fish taking the fly, set the hook,” he said. He started to fish up the stream and soon was out of my sight. There went my first cast, and then I saw Iwana rising out of nowhere trying to take the fly. I was completely startled. I cast again. Another Iwana jumped. It was so much fun and I immediately forgot myself. I never had a better excitement. I kept casting as fish rose every time I cast; however I caught none. A while later he came back to me and hollered, “Don’t stay at one spot. Look for other spots. Keep moving.” I received lots of teaching from him about fishing that day. Kashima was such a beautiful place. It was meditating and just being there soothed my soul. Needless to say, I went back to Kashima very next day. It took me about one and a half hours to get to Kashima from O-machi on foot. The brother suggested me to go to the Kago instead since it was closer. It took just about the half of the time to get to Kago. Fishing was, actually, more productive at the Kago. It didn’t take so long for me to catch more than ten Iwana a day. I enjoyed fishing as well as eating them. They were good eating either grilled or simmered. Standing in O-machi, there are the No-gu in the east and the Takase. You can also find the Kago and the Kashima confluence together up in the mountains in the west. (Note: There is a place called Kashima as well as the Kashima River) And the Takase runs through the west flank of O-machi. It flows from the Mt. Yari (Yarigatake) and I used to hear the flow of the river in my house when I was a child. Due to the dam built above the Takase around ninety years ago and the bypass constructions, the Takase doesn’t flow much today. I believe there are some environmental activities going on to revive the river today. It was the same brother who suggested selling Iwana I caught instead of eating them. I used to work for the South Manchurian Railway in China and I wasn’t a commercial fisherman that time yet. I had no idea how I would approach restaurants to sell Iwana. He was kind enough to introduce me to the finest restaurant in O-machi and I started a business with them. A dozen fish weighed about a little more than two pounds, which sold for three hundred yen. Well, I thought this was it; this was how I wanted to make a living. In 1948, my fishing buddy and I headed to Kurobe for fishing. It took us a whole day to get to Daira from O-machi. We were supposed to stay at a mountain hut there but it wasn’t open yet. We had no choice but to bivouac in a small hollow of a boulder. Next day, we were in Oyamadani and fished there. We found a vacant lodge where we grilled fish we caught. We were hoping to sell the fish we grilled; however, many rotted in our backpacks as we came back to O-machi. Fishing in Kurobe was very productive. My fishing buddy fished with bait and I did with Tenkara. My method, Tenkara was as effective as bait fishing. The only headache we had was how to preserve fish till we get back in O-machi. At this point, we didn’t know anything about smoking as a way to preserve fish. I went back to Kurobe again in August that year. As we got to the lodge, there were about five young people in front of it. They were from a village called Noguchi. They said there was a mountain man in the lodge and they were refused to share the lodge with him for a night. The lodge was owned by the local forestry office. I thought it was quite strange that someone wouldn’t want to share the lodge with others. Those young men feared the mountain man and left the lodge after all. I didn’t care much about the man so I went down the valley to fish. There were many promising pools there. As I was fishing toward the evening, there was a big man on the boulder looking down at me. This man was a famous fisherman and hunter, Fujiya Toyama. He indeed looked like a mountain man everyone would imagine. “Where did you come from?” his voice thundered in the valley. “I’m from O-machi,” I replied. We exchanged a few words. He happened to know my family and the business we had in O-machi. After a short chat, he invited me to his hut that he built on his own. We talked with each other and he asked me if I wanted to fish with him. He had been fishing a few days earlier I starte. “I have about 4.5 kilos of rice left. Why don’t you give me some and fish with me?” Fujiya said. I had about 7 kilos and I just gave all I had to him. I think that earned his trust. He seemed quite pleased and said, “You can fish as much as you want. I will do everything else. I will cook for you. I will clean and smoke the fish.” I can’t tell you how happy I was that moment. I thought this was as good as it would get. We caught around fifty Iwana that day. He lays the fish on a tarp and starts gutting them with his folding knife. He then skewers and lays them around the fireplace. He taught me the way to cook fish depending on where they are caught. He told me to grill fresh water fish with belly side facing the fire. For salt water fish, the back side facing the fire. As the fish being cooked, the pectoral fins start opening up away from the body, which we have to attach to the body again. If the fins are wide open, we cannot stack them and fins can get chipped. Fish without fins lose commercial values. It was just amusing for me to watch Fujiya cure the fish. Around seven in the next morning, I woke up with the smell of breakfast he prepared. We ate breakfast and I was given a steel pot filled with rice for lunch. I put my lunch and took off for fishing. I fished all day. I think I caught nearly two hundred Iwana while Fujiya caught about forty. I had to empty my creel many times and kept the fish in a small makeshift pond. At the end of the day, I stuffed my pack with the fish I had caught that day. Most of them were about a foot long. Others were more or less. The pack was heavy with two hundred fish inside. Fujiya called me master fisherman that evening for the first time. You can guess how pleased I was to hear that. Fujiya salted Iwana for lunch. He puts gutted fish, salt and a little garlic in a jar to make it. I had it with rice. It was just marvelously delicious. I wish I had some to share with you today. Speaking of food, we carry some vegetables, pickles and daikon radish, but that runs out in a few days. My pack usually weighed around 70 pounds since I had to carry all the necessities including food. Miso was indispensable for soup, but it’s heavy. Therefore, when I make miso soup, I water out the soup and put salt instead. Salted fish was mainly for lunch and dinner. I had smoked fish for breakfast. It’s all you can eat. Imagine we catch two hundred Iwana a day. Fujiya made me salted and dried Iwana intestines. It was so good with sake, beer or any drinks. The way we smoked the fish was a bit different from a conventional way. We dehydrate the fish completely. If fish are not dehydrated enough, they will rot. The fish Fujiya smoked would last for a few years. Some people speak ill of Fujiya, but he is very responsible for his business. He was very diligent so that he kept a journal every day for our catches. According to it, I’ve caught two hundred fifteen Iwana a day, which was my best record. Fujiya and I had three more fishing trips to Kurobe in the year we met. Each trip took us more than ten days. We need sell the fish we catch after each trip. I recall that we had about two thousand five hundred fish each time. Although the fish was smoked and dehydrated, they weighed about one hundred ten pounds. On one trip, we decided to go down the valley called Hannokidaira. It took a day to get there and fished for two days. There were so many fish. Around every single rock or boulder, there were fish. In every eddy or pocket water, there were fish. I even saw two Iwana going for my Tenkara fly at the same time. We again caught five hundred fish in the course of two-day fishing. Yet, there was a problem. The Iwana we caught in Hannokidaira was so skinny like eels. There were just too many fish in the stream. We had to crop excess fish out of the stream. We call Iwana in Kurobe maggots since there are too many of them. It was the same there. It took us two years to crop out excess Iwana out of the stream. In the third year, we found Iwana getting a little fatter and healthier. But there were tons of fish there. When I waded using my fishing rod as a wading staff, I had a fish on at the end of the line. By the way, I used to meet a man who was almost blind in Kurobe. He even caught about one hundred fifty fish a day. Anyone could catch that many there that time. Fujiya usually wakes me up at seven every morning. One day, I asked him to wake me up before dawn. I wanted to see if I could catch fish in the dim. It was just about I could see my kebari, I cast on the shallow. I had fish with every cast until the sun was above the horizon. Because of this fishing frenzy, I often got up at three in the morning to catch fish before daybreak. Let me back up a little here. We had more than one hundred pounds of fish to sell. We went to a town called Shirahone where we could sell fish to traditional Japanese inns and restaurants. Fujiya seemed to know everyone in town. We stayed at one of the inns for free. We’ve been to places like Nakanoyu and Kamikochi, too. Wherever we went people knew Fujiya. Simply thanks to him, I could sell fish without any problem at all. Fujiya once told me that he had a gold mining business before the war. When he talks about himself sitting around the fire, his eyes gleam just like a wild animal. He can thread a needle and saw in the dim light of a lantern. He was quite a man indeed. He was over sixty that time, I think. It was mid-October and we went on our last trip to Kurobe that year. Snow was just a few weeks away. Fujiya wanted to catch martens for the fur. Fishing wasn’t productive. It was too cold. Ice was forming at pools. Fujiya even tried bear hunting, but his efforts were in vain. We caught just a few fish and martens. We decided to go back home on the first of November. He made me two pairs of sandals with toe/heel protections out of rice straws. There was one and a half foot of snow on the pass. It bothered me but it didn’t Fujiya. He seemed to know everything about mountains. It took us a half day, but he finally guided me though to a mountain hut for a short break. Then we made it to O-machi in the afternoon. I wouldn’t have successfully fished or even survived without Fujiya. I can’t tell how thankful to him. Let me wrap up my speech with one thing. Our country has prospered as the sacrifice of nature. Thank you. Thank you so much for this Daniel – I love (and often make reference to) the idea that Bunpei Sonehara really straddles the changeover period of tenkara as a profession to that of an artistic pastime. These insights are fantastic. That was a good piece to read. Great story! Puts me in a great mood to continue fishing and also telling the new stories of tenkara in this modern time. I think tenkara will have many great stories to tell in the coming years. What a wonderful story, Daniel! Great to a very detailed view of one person’s commercial fishing history. Thanks for posting it! Thank you so much for the story, Daniel. It makes me closer to the roots of tenkara. Great post and an inspirational story, Daniel. Thanks, Masaki, for translating this for us! Fantastic…his words bring clear images of early Tenkara fishing and life in the mountains of Japan. His relationship with Fujiya as a teacher and mentor reminds me of those Kindred Spirits that have passed on the passion of Angling to me..Arigato Daniel for having Masaki translate this for us. Thank you Daniel for sharing this story. It heightens my eagerness to receive my gear and go forth on my learning experience. Thanks for sharing this with the group. Nice story with a little nostalgic and sad end. I find it interesting that in the early days the Iwana caught in Hannokidaira and Kurobe were undersized due to over abundance of fish. Thus the large numbers caught improved the health of the fish. Man’s intervention improved the environment in this case. Now I would like to know more about Fujiya Toyama too.